This rare expression of Napa Valley winemaking is one of only 60 bottles that will ever be made. Think of it as a bit of Napa Valley history in your cellar and celebrated in a glass with friends and family. For the first time, O'Shaughnessy Estate Winery will be offering a Premiere Napa Valley Cabernet Sauvignon that brings both of their mountain estates together. Composed of 50% Cabernet Sauvignon from the stunning Aphitheater Vineyard on Howell Mountain and 50% Cabernet Sauvignon from the steeply terraced Betty's Vineyard on Mount Veeder, this is truly a one-of-a-kind wine that will stand the test of time. It was aged in French oak barrels for 28 months for additional depth and complexity. Sean Capiaux has deftly established an impressive and notable career over the past 21 years at prominent wineries around the globe since his graduation from California State University, Fresno (BS, Enology; minor in Chemistry) in the late ’80s. In 1994 Sean launched his own label, Capiaux Cellars, which has garnered consistently favorable reviews among both professional reviewers and his own following of restaurateurs and consumers. With his rich history in the wine industry and vibrant resume, it is no surprise that Betty O’Shaughnessy chose Sean to be the crafting hand behind O’Shaughnessy wine. He began his career at Jordan Winery in Sonoma County's Alexander Valley where he worked for two years before joining Houghton Winery located outside Perth in Western Australia. After experiencing the harvest in Australia, Sean returned to the United States to work as assistant winemaker at Pine Ridge Winery in the Stags Leap District of Napa Valley. Two years later Sean joined Peter Michael Winery in Calistoga as the assistant winemaker where he worked for four years. In 1996, Sean and his wife moved to New York. As a bicoastal winemaker, Sean continued to produce Capiaux Cellars Pinot Noir in California while also working as the winemaker for Macari Vineyards, Jamesport Vineyards and Schneider Vineyards on the North Fork of Long Island, NY. In 2000, Betty O’Shaughnessy recruited Sean to be the winemaker for her new O’Shaughnessy Estate Winery. 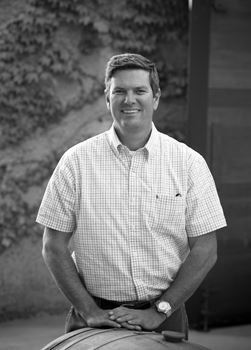 Sean serves as president and winemaker for O'Shaughnessy winery today, consistently crafting world-class mountain Cabernets and continuing to make his Capiaux Cellars Pinot Noir.